ABSTRACT: Incorporation of drugs into non-ionic surfactant vesicles (niosomes) during their manufacture affords a possible method of achieving controlled release. The aim of this study is to formulate niosomes as carriers for delivery of diclofenac sodium (DCS). Niosomes are prepared with a series of sorbitan monoesters (Span 20, 40, 60, and 80) and sorbitan tri-oleate (Span 85) and co-surfactants of polyoxyethelene fatty acid esters (Tween 20, 40, 60, and 80), with or without cholesterol and charged lipids like stearylamine or dicetylphosphate. The prepared niosomes were evaluated for the entrapment efficiency (EE %) and in-vitro release rate of DCS. Niosomes formed of Span 60 gave the highest EE %, followed by Span 40, 20, 80 and 85. It was also found that increasing the total lipid concentration resulted in an increase in the EE %. However, the amount of encapsulated DCS (mg) per mmole lipid decreased. Increasing the concentration of DCS was accompanied by a slight increase in the EE % and a great increase in the entrapment efficiency expressed as mg/mmole lipid. Niosomes prepared by ether-injection method and reverse-phase evaporation method resulted in a marked increase in the EE % compared to those prepared by hand-shaking method. It was demonstrated that the uses of co-surfactants like different types of Tween with Chol in a molar ratio of 25:25:50 caused an increase in the EE %. Niosomes prepared from Span 40 and 60 showed the slowest release rate than those prepared from Span 20, 80 and 85. However, the incorporation of co-surfactants into niosomes resulted in a greater decrease in the release rate of DCS from niosomal vesicles. colloidal particulate carriers such as nanoparticles, liposomes, microemulsions and niosomes have distinct advantages over conventional dosage forms because the particles can act as drug containing reservoirs. Modification of the particle composition or surface can adjust the affinity for the target site and/or the drug release rate, and slowing drug release rate may reduce the toxicity of drug. So, these carriers play an increasingly important role in drug delivery 1. Niosomes are non-ionic surfactant vesicles that can carry hydrophilic drugs by encapsulation or lipophilic drugs by partitioning of these drugs into hydrophobic domains 2. Niosomes are unilamellar or multilamellar spheroid structures composed of hydrated mixtures of cholesterol and non-ionic surfactants. The bilayer membrane of niosomes mimics biological membranes giving them increased stability and residence time in circulation. From a technical point of view, niosomes are promising drug carriers as they possess greater stability and lack of many disadvantages associated with liposomes, such as chemical instability, high cost, variable purity of natural phospholipids and special requirements for handling and storage 3. Another advantage is the simple method for the routine and large-scale production of niosomes without the use of unacceptable solvents. Niosomes have been extensively investigated for their application as controlled release drug delivery and drug targeting. Niosomes have attracted a great deal of attention in the delivery of dermal drugs because of many advantages, like they are biodegradable, biocompatible, non-toxic, non-immunogenic in nature and effective in the modulation of drug release properties 4. In recent years, niosomes received a great attention as potential drug delivery systems for different routes of administration, such as intravenous and intramuscular, subcutaneous,intraperitoneal 5 and transdermal 6. Diclofenac sodium (DCS) is a non-steroidal anti-inflammatory drug (NSAID). In pharmacologic studies, diclofenac has shown anti-inflammatory, analgesic, and antipyretic activities. DCS is used in the treatment of osteoarthritis 7 , rheumatoid arthritis ankylosing spondylitis. The purpose of this work is to formulate niosomal preparations of diclofenac sodium (DCS) and to evaluate the in-vitro performance of the prepared niosomes. Materials: Diclofenac sodium (DCS) was a gift sample kindly supplied by Egyptian International Pharmaceutical Industries Co., EPICO, El-Asher of Ramadan city, Egypt. Span 20, 40, 60, 80, and 85, Cholesterol (Chol), dicetylphosphate (DCP) and stearylamine (SA) were purchased from Sigma Chemical Co., St. Louis, MO, USA. Tween 20, 40, 60, and 80 were purchased from El-Nasr Pharmaceutical Chemical Co., Cairo, Egypt. Diethyl ether was purchased from s.d. Fine Chem. Ltd., India. All other chemicals were obtained from El-Nasr Pharmaceutical Chemical Co., Cairo, Egypt. All ingredients were used as received. Preparation of Non-ionic Surfactant Vesicles (NISVs): All DCS-entrapped niosomes were prepared from a mixture of non-ionic surfactants, with or without Chol and with or without charge inducing agents as SA or DCP in different molar ratios. The total lipid concentration was 300 µmole. Hand-shaking method (HSM):The lipid mixture was dissolved in 15 ml diethyl ether in a round-bottom flask. The organic solvent was removed using a rotary evaporator to form a thin film on the wall of the flask. The completely dried film was hydrated with 5 ml of PBS (pH 7.4) containing drug (5 mg/ml) at 60oC for one hour with gentle agitation to form niosomal dispersion with milky appearance 8. The resulting MLVs were then left to cool for the separation of un-entrapped drug. Ether-Injection method (EIM):The lipid mixture was dissolved in 15 ml diethyl ether and injected slowly through a needle at 0.25 ml/min into 5 ml of PBS (pH 7.4) containing drug (5mg/ml) maintained at 60oC. The organic solvent was evaporated using a rotary evaporator. Large unilamellar vesicles (LUVs) were formed during the evaporation of organic solvent 9. Reverse-Phase Evaporation method (REV):The lipid mixture was dissolved in 15 ml diethyl ether and emulsified in aqueous phase (2 ml) containing drug (5 mg/ml) using vortex mixer for 10 min. The organic solvent was removed by swirling at room temperature to obtain a thick gel. The resulting gel was further hydrated with 3 ml PBS (pH 7.4). The evaporation was continued until the hydration was completed10. Sizing of the Vesicles: NISVs were mounted on a glass slide and examined under a phase contrast microscope with magnification of 400x using a stage micrometer to determine the size of the vesicles 11. In-vitro drug release from Niosomes: The in-vitro release of DCS from NISVs was determined by a simple dialysis method. One ml of the dialyzed vesicle dispersion or DCS solution was placed into a glass tube to which a cellophane membrane was attachedtoone side, the tube was suspended in 250 ml beaker containing 100 ml PBS (pH 7.4). The solution was maintained at 37οC ± 0.5οC and stirred at 100 rpm in a thermostatically controlled water bath shaker. Four milliliters samples were withdrawn at specified time intervals and replaced with an equal volume of fresh buffer solution (pH 7.4) at the same temperature to keep the volume of the solution constant during the experiment. The samples were analysed spectrophotometrically at 276 nm against PBS (pH 7.4) as a blank 11. In-vitro release of plain drug solution of the same concentration as in niosomal dispersion was also studied. Examination of niosomes by Transmission Electron Microscope: Niosomes were analyzed by negative stain electron microscopy using 2% ammonium molybdate solution 12, 13. 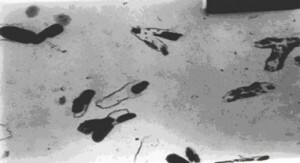 0.5ml niosomal suspension and 0.5ml negative stain were mixed, and one drop placed on a carbon-coated grid and allowed to dry. 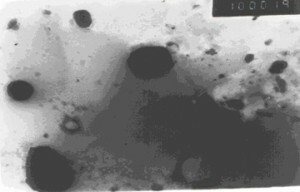 Grids were rinsed with water to remove excess stain, and examined with an electron microscope (100 CX, Jeol, Tokyo, Japan). RESULTS AND DISCUSSION: The effect of variables on the entrapment efficiency and in-vitro release rate was investigated. The variables studied were: type of surfactant; lipid composition (cholesterol content and incorporation of charge inducing agents); total lipid concentration; drug concentration; method of preparation (HSM, EIM and REV) and incorporation of co-surfactants. The time of hydration, temperature of hydration and volume of aqueous phase were kept constant unless otherwise indicated. 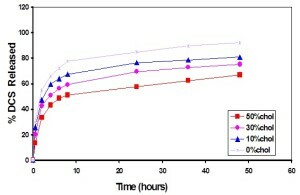 Effect of Surfactant Structure on the entrapment efficiency of DCS and vesicles size: The results are listed in table 1. Span 60 and Span 40 showed the highest EE % among all Spans formulations, this may be attributed to the surfactant structure. It is known that Span 20, 40, 60, 80 and 85 have the same head group and different alkyl chain. For these non-ionic surfactants, only Span 80 has an unsaturated alkyl chain. The introduction of such double bond into the alkyl chain made the membrane more permeable 14. Span 40 and 60 are solid at room temperature and have the highest phase transition temperature (TC) 15, 16. The surfactant having the highest (TC) produces the highest entrapment efficiency, so, the results here investigated the influence of (TC) on the EE. Span 60 was the selected surfactant in the further experiments. As for vesicle size, niosomal vesicles prepared from Span 20 had the greatest vesicle size and vesicles prepared from Span 85 had the lowest vesicle size, table 1. This effect is related to the inverse relationship between hydrophobicity of the non-ionic surfactant and vesicular diameter of niosomes 17, decreasing the hydrophobicity of the surfactant resulted in an increase of the vesicles size. The observed relationship between the vesicular diameter of niosomes and sorbitan fatty acid ester hydrophobicity has been attributed to the decrease in surface free energy with increasing hydrophobicity, resulting in smaller vesicles 18. The niosomal vesicles size followed the trend Span 20 (HLB=8.6)>Span 40 (HLB=6.7)>Span 60 (HLB=4.7)>Span 80 (HLB=4.3)>Span 85(HLB=1.8) 19. HLB: Hydrophilic-Lipophilic balance. S.D = standard deviation. Mean size = mean diameter calculated for 50 vesicles. Effect of cholesterol concentration on the entrapment efficiency of DCS in niosomes prepared by HSM: The results are listed in table 2. Niosomes prepared without cholesterol had certain entrapment efficiency and this value was increased with increasing the concentration of cholesterol. Cholesterol is one of the common additives incorporated in the lipid bilayer to impart rigidity of the membrane, and to prepare stable niosomes. Cholesterol is known to abolish the gel to liquid phase transition of the niosomal systems producing niosomes that are less leaky and less permeable 16,20. The incorporation of cholesterol into the lipid bilayers increases the width of the bilayers and increases the vesicle size 15. 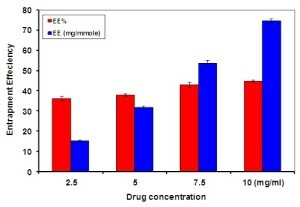 1 reported that equal molarity of non-ionic surfactant and cholesterol makes the membrane compact, well organized and prevents the leakage of drug from niosomes, so, the formulations of niosomes with molar ratio 1:1 is the most beneficial for the efficient entrapment, this ratio was selected for further experiments. Cholesterol % Surf: Chol Molar ratio (in µmole) Surf: Chol weighed qty. (mg) EE % ± S.D. Each result is the mean of 3 determinations ± standard deviation (S.D). Effect of total lipid concentration on the entrapment efficiency of DCS in niosomes prepared by HSM: The effect of total lipid concentration on the entrapment efficiency of DCS in the NISVs was examined by changing the total lipid concentration while keeping the drug concentration constant (5mg/ml), the results are shown in figure 1. For Span 60 and cholesterol in the molar ratio 1:1, the EE% increased from (16.45 ± 0.87 %) to (60.96 ± 1.01 %) as the total lipid concentration was increased from 100 µmole to 1000 µmole. However, the amount of entrapped DCS (mg) per mmol lipid decreased as the total lipid concentration increased 21. This means that the amount of lipid taking part in the encapsulation decreased as the lipid concentration increased. 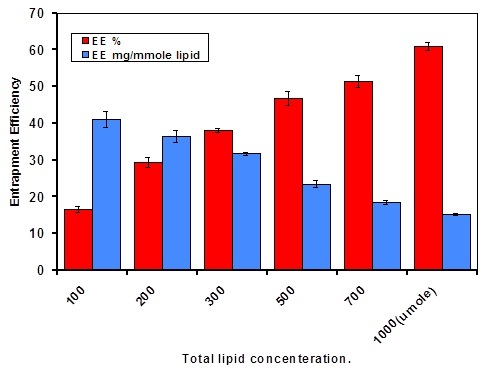 A similar increase in EE % and decrease in the EE per mmole lipid was previously observed when the total lipid concentration was increased from 10 mg/ml to 30 mg/ml during the formulation of liposomes containing timolol maleate 22. FIG. 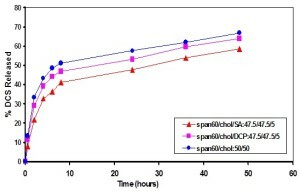 1: EFFECT OF TOTAL LIPID CONCENTRATION ON THE EE OF DCS IN NIOSOMES PREPARED BY HSM, LIPID COMPOSITION = (SPAN 60: CHOL=1:1). Effect of drug concentration on the entrapment efficiency of DCS in niosomes prepared by HSM: The effect of drug concentration on the EE of DCS in NISVs was examined by changing the amount of drug incorporated while keeping the total lipid concentration constant (300 µmole), the results are shown in figure 2. For Span 60 and Chol (1:1), the entrapment efficiency % scarcely increased as the drug concentration in the aqueous phase was increased. However, the amount of entrapped DCS expressed as mg per mmole lipid was greatly increased as the drug concentration increased from (2.5 mg/ml) to (10 mg/ml). This means that the total aqueous volume has a nearly constant value. As the percentage of drug encapsulation depends upon the amount of the aqueous phase enveloped in the niosomal vesicles during preparation, the result that the EE slightly changed with increasing drug concentration suggests that the enveloped aqueous phase was the same irrespective of drug concentration 23. FIG. 2: EFFECT OF DRUG CONCENTRATION ON THE EE OF DCS IN NIOSOMES PREPARED BY HSM, LIPID COMPOSITION= (SPAN 60: CHOL=1:1). Effect of charge-inducing agents on the entrapment efficiency of DCS in niosomes prepared by HSM: The effect of charge on the EE of DCS in HSM niosomes was examined by incorporation of charge-inducing agents as (SA) for induction of positive charge or (DCP) for induction of negative charge, the results are shown in table 3. Positively charged niosomes showed the highest EE followed by negatively charged niosomes and neutral niosomes. In this study, it is likely that the increased entrapment of DCS is due to the formation of lipophilic ion-pair between DCS and SA, which partitions into the lipid bilayers. The increase of EE % in the presence of charge-inducing agents is attributed to the presence of charged interface, so there is an electrostatic repulsion between adjacent bilayers causing an increase in the distance between the bilayers; this leads to arise in the volume of the internal aqueous compartment of the NISVs 24. The presence of charge also prevents aggregation of niosomal vesicles andincreases the stability of niosomal dispersions 25. Effect of method of preparation on the entrapment efficiency of DCS in niosomes: Table 4 shows the EE of NISVs prepared by different methods. 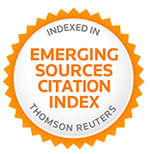 The EE% of niosomes prepared by EIM and REV exhibited a higher value than that prepared by HSM. The difference in EE % may be due to the greater encapsulated volume in unilamellar/oligolamellar vesicles of EIMand REV 26 than multilamellar vesicle structure of HSM 15. The tendency of a drug to interact by various forces such as polar and non-polar forces and/or electrostatic interactions with the bilayer, determines whether it would be incorporated into the aqueous compartments or into the bilayer structures or whether it would be firmly associated with the polar head groups of the bilayers via electrostatic interactions. Effect of co-surfactants on the entrapment efficiency of DCS in niosomes prepared by HSM:The effect of co-surfactants on the entrapment efficiency of DCS in MLVs was examined by using a mixture of Span 60, Tweens and cholesterol in a molar ratio 25:25:50 and compared with vesicles prepared by Span 60 and Chol only in the molar ratio 50:50, the results are shown in table 3. Niosomes prepared from a mixture of Span 60 with co-surfactants resulted in a greater increase in the EE% compared with those prepared from Span 60 without any co-surfactant. Niosomes prepared from a mixture of Span 60 and Tween 60 had the highest EE % followed by those prepared from a mixture of Span 60 and tween 40, Span 60 and Tween 20 and then those prepared from Span 60 and Tween 80. The increase in the EE % may be related to the lower HLB value of Span 60 (4.7) compared with HLB values of any type of the Tween (HLB values are 16.4, 15.6, 14.9 and 15.0 for Tween 20, 40, 60 and 80, respectively). The higher entrapment efficiency of niosomes prepared from Span 60 and different co-surfactants could be attributed to the larger diameter of vesicles which resulted from the lower hydrophobicity of the mixture of Span 60 and any Tween when compared with Span 60 alone 17. This effect may be also related to the increase in the membrane rigidity and formation of less leaky niosomal vesicles upon using co-surfactants27. Release of DCS from niosomes: From the data of in-vitro release of DCS figure 3, the rate of release of DCS through a dialysis membrane, for all the prepared formulations, was slower than that obtained from free DCS solution. 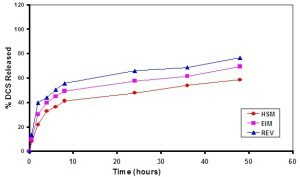 Therefore, it was noticed that there is an efficiency of the niosomal preparations in slowing down the rate of release of the drug compared with the free drug solution, which released about 95% within 5 h. The release of DCS, from all DCS loaded vesicles, occurred in two distinct phases, an initial rapid phase, which stayed for about 6-8 h, followed by a slow phase but continued for at least 24 h. This biphasic release profile agreed with the release profile of tenoxicam from Span 60/cholesterol niosomes 28. 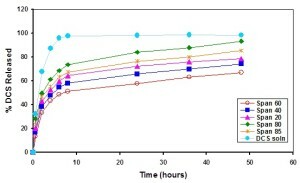 Effect of surfactant structure on the in-vitro release of DCS from NISVs prepared by HSM: Figure 3 shows the effect of surfactant structure on the in-vitro release of DCS from niosomes prepared by HSM. The rate of release of DCS from NISVs prepared by HSM was the lowest for Span 40 and Span 60 and the highest for other types of Spans. This was attributed to higher phase transition temperature (Tc) for Span 40 and Span 60 than that of other Spans 15. So, Span 40 and Span 60 form vesicles with less permeable and less leaky rigid bilayers than other Spans which form more permeable fluid bilayers26. Moreover, Span 80 possesses an unsaturated alkyl chain, which makes the membrane more permeable14. FIG. 3: EFFECT OF SURFACTANT STRUCTURE ON THE IN-VITRO RELEASE OF DCS FROM NISVS PREPARED BY HSM (SPAN: CHOL, 50:50). Effect of cholesterol concentration on the in-vitro release of DCS from NISVs prepared by HSM: Figure 4 demonstrates the effect of cholesterol concentration on the in-vitro release of DCS from niosomes prepared by HSM. The rate of release of DCS from NISVs prepared by HSM decreased as the cholesterol concentration increased, and became the slowest for the formulation of niosomes with equimolar ratio of Span 60 and cholesterol. This may be related to the fact that the incorporation of cholesterol into the lipid bilayers modifies the membrane fluidity by decreasing the movement of the mobile hydrocarbon chains of the non-ionic surfactant leading to the loss of bilayer permeability 13. Also, the marked reduction of the efflux of DCS in the presence ofcholesterol may be due to its membrane stabilizing ability 29. Fig. 4: Effect of cholesterol concentration on the in-vitro release of DCS from NISVs prepared by HSM. Effect of charge on the in-vitro release of DCS from NISVs prepared by HSM: Figure 5 shows the effectof charge on the in-vitro release of DCS from NISVs prepared by HSM. The release profiles of DCS from neutral and charged niosomal formulations showed that neutral niosomes had the highest rate of drug release followed by negatively charged niosomes, then positively charged ones. This is ascribed to that charged lipids serve to tighten the molecular packaging of the vesicle bilayers 30, resulting in decreased rate of drug release from charged niosomes. The results are in accordance to those of 31 who reported that positively charged liposomes of acetazolamide showed the highest rate and extent of drug release. Effect of method of preparation on the in-vitro release of DCS from NISVs: Figure 6 illustrates the effect of method of preparation on the in-vitro release of DCS from NISVs. The DCS-entrapped in niosomes prepared by HSM showed a rate of release slower than those prepared by EIM and REV. After the first 6h about 36.29%, 44.94% and 50.35% of entrapped drug were released from vesicles prepared by HSM, EIM and REV respectively. This was attributed to that the vesicles prepared by EIM and REV are unilamellar and oligolamellar vesicles which possess a large encapsulated volume and a single lipid bilayer barrier to drug diffusion 32,while HSM produces MLVs which possess multi-lipid bilayers barriers to drug diffusion. Multilamellar vesicles are the preparation most widely used, due to their simplicity and reproducibility in the preparation. The HSM forming MLV and showing the least permeability was selected for further study. FIG. 6: EFFECT OF METHOD OF PREPARATION ON THE IN-VITRO RELEASE OF DCS FROM NISVS, LIPID COMPOSITION (SPAN 60: CHOL: SA =47.5: 47.5: 5). 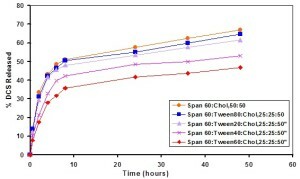 Effect of co-surfactants on the in-vitro release of DCS from NISVs prepared by HSM: The use of Span 60: Tweens system appeared to be advantageous in terms of drug release characters, figure 7. Niosomes prepared from a mixture of Span 60 and Tweens showed a greater decrease in the in-vitro release of DCS and resulted in a less leaky niosomes compared with niosomes prepared from Span 60 and Chol alone. This effect may be related to the increase in membrane rigidity and decrease of permeability upon using co-surfactants. The greatest effect was found with Span 60: Tween 60: Chol system and the lowest effect with Span 60: Tween 80: Chol system. This effect may be attributed to the length and nature of the alkyl side chain of co-surfactant used. The longer alkyl chain, the slower release rate of DCS from niosomal vesicles 27. 15 reported similar results for a series of Span niosomes.Tween 60 and Tween 80 have the same head group but have different alkyl side chain. Tween 80 has an unsaturated alkyl chain; this double bond causes a greatest increase in the bilayer permeability and chain fluidity 14. Examination of niosomes by the electron microscope: The negative stain micrographs of niosomes prepared from Span 60/Chol (50:50) and Span 60/Tween 60/Chol (25:25:50) are shown in figure 8a and b. It was found that the conventional spherical vesicles were obtained in case of niosomes prepared from Span 60/Chol (50:50). However, a high proportion of elongated vesicles observed with niosomes prepared from Span 60/Tween 60/Chol (25:25:50). The obtained results are in agreement with those of 27 who reported the formation of non-spherical vesicles for niosomes prepared from a mixture of a single or double alkyl chain non-ionic surfactant with Chol. FIG. 8: TRANSMISSION ELECTRON MICROGRAPHS OF NIOSOMES (A) SPAN 60/CHOL (50:50) AND (B) SPAN 60/TWEEN 60/CHOL (25:25:50). CONCLUSION: The encapsulation efficiency of niosomes towards DCS is a function of several variables such as the type of non-ionic surfactants, co-surfactants, the incorporated cholesterol, the introduction of charge inducing agents and the methods of preparation. The above mentioned variables also affect the drug release from the prepared niosomes. The optimum formulation which encapsulating a high percentage of DCS which could be released at a controllable rate over a prolonged period of time is (Tween 60/Span 60/Chol in a molar ratio of 25/25/50). Hao Y, Zhao F, Li N, Yang Y, Li K. Studies on a high encapsulation of colchicine by a niosome system. Int J Pharm 2002; 244: 73-80. Blazek-Welsh AI, Rhodes DG. Maltodextrin -based proniosomes. AAPS Pharm Sci 2001;3(1): E1. Carafa M, Santucci E, Alhaique F, Coviello T, Murtas E, Riccieri FM, Lucania G, Torrisi MR. Preparation properties of new unilamellar non-ionic/ionic surfactant vesicles. Int J Pharm 1998; 160: 51-9. Uchegbu IF, Vyas SP. Non-ionic surfactant based vesicles (niosomes) in drug delivery. Int J Pharm 1998;172: 33-70. Hashim F, El-Ridy M, Nasr M, Abdallah Y. Preparation and characterization of niosomes containing ribavirin for liver targeting. Drug delivery2010; 17 (5): 282-7. Sathal AA, Rajalakshmi G. Evaluation of Transdermal Targeted Niosomal Drug Delivery of Terbinafine Hydrochloride. Int J PharmTech Res. 2010; 2(3): 2081-9. Barthel HR, Haselwood D, Longley S, Gold MS, Altman RD. Romized controlled trial of diclofenac sodium gel in knee osteoarthritis. Semin Arthr Rheum2009; 39(3): 203-12. Jatav VS, Singh SK, Khatri B, Sharma AK, Singh R. Formulation and in-vitro evaluation of Rifampicin-Loaded Niosomes. J Chem Pharm Res 2011; 3(2):199-203. Okore VC, Attama AA, Ofokansi KC, Esimone CO, Onuigbo EB. Formulation and Evaluation of Niosomes. Indian J Pharm Sci 2011; 73(3):323-8. Singh G, Dwivedi H, Saraf SK, Saraf SA. Niosomal Delivery of Isoniazid-Development and Characterization. Trop J Pharm Res 2011; 10(2): 203-10. Firthouse PUM, Halith SM, Wahab SU, Sirajudeen M, Mohideen SK. Formulation and Evaluation of Miconazole Niosomes. Int J PharmTech Res 2011; 3(2): 1019-22. Song Y, Hyun SY, Kim H, Kim C, Oh J. Transdermal delivery of low molecular weight heparin loaded in flexible liposomes with bioavailability enhancement: comparison with ethosomes. J Microencap 2011; 28(3): 151-8. Sammour OA, Al-Zuhair HH, El-Sayed MI. Inhibitory effect of liposome-encapsulated piroxicam on inflammation gastric mucosal damage. Pharm Ind 1998; 60(12):1084-7. De Gier J, Mersloot J, Van Deenen L. Lipid composition permeability of liposomes. Biochim Biophys Acta 1968; 150:666-75. Yoshioka T, Sternberg B, Florence AT. Preparation and properties of vesicles (niosomes) of sorbitan monoesters (Span 20, 40, 60, 80) and sorbitan triesters (Span 85). Int J Pharm 1994; 105:1-6. Lingan MA, Sathali AAH, Kumar MRV, Gokila A. Formulation and evaluation of topical drug delivery System containing clobetasol propionate niosomes. Sci Revs Chem Commun 2011; 1(1):7-17. Yoshioka T, Sternberg B, Moody M, Florence AT. Niosomes from Span surfactants: Relationship between structure forms. J Pharm Pharmcol 1992; 44:1044-50. Vora B, KJhopade AJ, Jain NK. Proniosome based transdermal delivery of levonorgestrel for effective contraception. J Cont Rel 1998; 54:149-65. Kibbe AH. Handbook of Pharmaceutical Excipient. 3rd edn. American Pharmaceutical Association Washington D.C; 2000. p. 511-514. Rogerson A, Cummings J, Florence AT. Adriamycin-loaded niosomes-drug entrapment, stability and release. J Microencap 1987; 4:321-8. Abu-Zaid SS, El-ghamry HA, Hammad M, Mokhtar M. Effect of some formulation parameters on encapsulation release profile biological activity of liposomes containing certain drugs. M. J. P. S 2003; 19(2):76-89. Sammour OA. Improvement of encapsulation efficiency of timolol maleate in liposomes by the freeze-thawing method. Zag J Pharm Sci 1992; 1(1-2):34-42. Mokhtar M, Sammour OA, Hammad MA, Megrab NA. Effect of some formulation parameters on ﬂurbiprofen encapsulation and release rates of niosomes prepared from proniosomes. 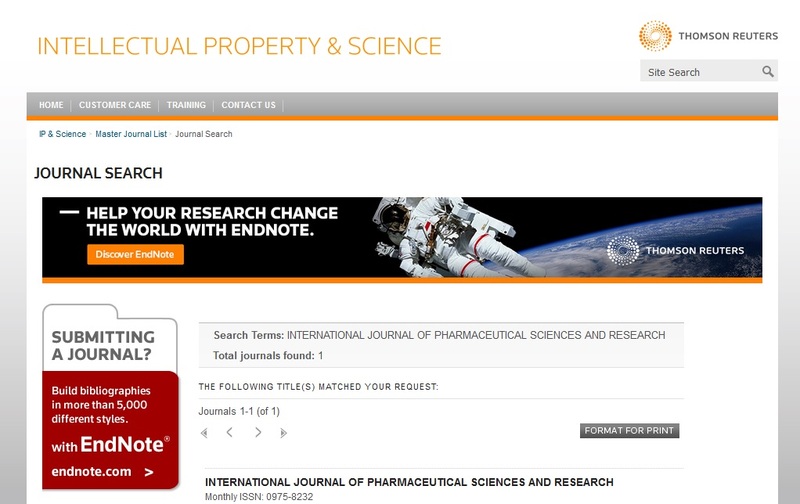 Int J Pharm 2008; 361: 104-11. Ridy MS, Abdelbary A, Essam T, Abd El-Salam RM, Kassem AAA. Niosomes as a potential drug delivery system for increasing the efficacy and safety of nystatin. Drug Dev Ind Pharm 2011; 37 (12):1491-508. Gianasi E, Cociancich F, Uchegbu IF, Florence AT, Duncan R. Pharmaceutical and biological characterization of a doxorubicin-polymer conjugate (PK) entrapped in sorbitan monostearate, Span 60 niosome. Int J Pharm 1997; 148: 139-48. Namedeo A, Jain NK. Niosomal delivery of 5-flurouracil. J Microencapsul 1999; 16(6): 731-40. Darwish IA. Preparation characterization of niosomes formed from mixed non-ionic surfactant Cholesterol. Alex J Pharm Sci 1998; 12(1): 33-8. Popli H, Nair MS. Niosomal delivery of tenoxicam. Indian J Pharm Sci 1996; 58(4):163-6. Betageri GV, Parsons DL. Drug encapsulation and release from multilamellar and unilamellar liposomes. Int J Pharm 1992; 81:235-41. Omaima NE, Ahmed HH. Preparation and evaluation of acetazolamide liposomes as an ocular delivery system. Int J Pharm 1997; 158:121-5. Hathout RM, Mansour S, Mortada ND, Guinedi AS. Liposomes as an ocular delivery system for acetazolamide: in vitro and in vivo studies. AAPS PharmSciTech 2007; 8(1): 1-12. Sammour OA, Hassan HM. Enhancement of the antibacterial activity of ampicillin by liposome encapsulation. Drug Delivery 1996; 3:273-8. Marwa A, Omaima S, EL-Ghamry Hanaa and Mohammed AS: Preparation and in-vitro evaluation of Diclofenac Sodium Niosomal Formulations Int J Pharm Sci Res 2013; 4(5); 1757-1765.